Headquartered in Vanderbijlpark, Gauteng, ArcelorMittal South Africa is the largest steel producer on the African continent., with a production capacity, in a normal year, of 7 million tonnes of liquid steel per annum , after taking into account various yield factors, amounts to approximately 5.5 million tonnes of saleable steel products. The company supplies over 60% of the steel used in South Africa and exports the rest to sub-Saharan Africa and elsewhere. The company has a depth of technical and managerial expertise that has been carefully nurtured since its inception in 1928. ArcelorMittal South Africa is well known for its reputation for reliability and a sharply defined business focus, which has forged the organisation into a modern, highly competitive supplier of steel products to the domestic and global markets. This has been achieved through on-going alignment with international best practices and a comprehensive understanding of the steel business environment, ensuring the company’s continued global competitiveness and participation in international markets. ArcelorMittal South Africa’s global standing is further underpinned as part of the world’s largest steel producer, the ArcelorMittal Group. 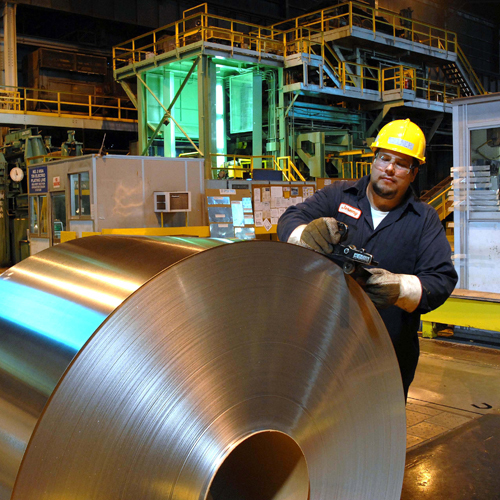 The company is the world’s number one steel company employing 232 000 employees worldwide. With an industrial presence in 60 countries across Europe, the Americas, Asia and Africa, ArcelorMittal has a balanced geographic diversity within all the key steel markets, both in developing and developed countries. Through this association, ArcelorMittal South Africa has access to world-class research and development, best practice processes, aggressive procurement contracts and international market leverage to ensure the company remains at the cutting edge of the international steel industry. The company’s ability to generate profits and cash throughout the fluctuations of the steel cycle is testimony to the success of years of intensive business re-engineering and the cultivation of a continuous improvement culture that has embedded ArcelorMittal South Africa’s position among the world’s lowest cash cost producers of steel. To add value to all our stakeholders through our market leadership position in Sub-Saharan Africa by producing quality steel products safely, being an employer and supplier of choice, while striving to be among one of the lowest-cost steel producers in the world. • Safety- Creating a safe environment for all to live and work in. • Caring- Fostering authentic relationships and valuing everyone. • Commitment- Solution-focused, delivering to our best. • Customer satisfaction-Building long term win-win partnerships.